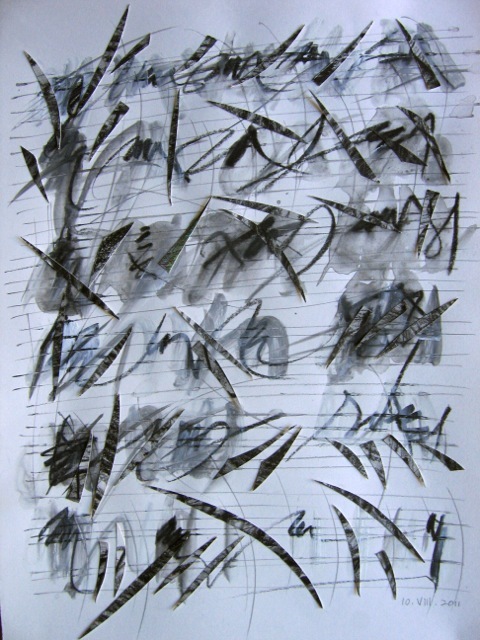 Austrian artist Maria Tupay Duque is known for her expressive paintings turning musical experiences and notations into her own visual language. 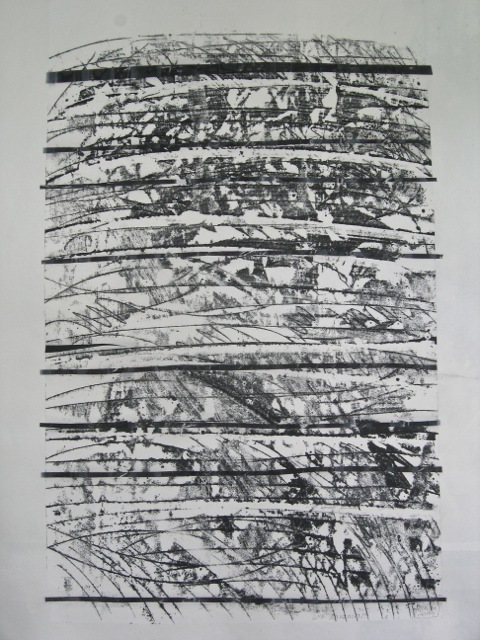 For several years she has been working on her series of “Music Scores”, large prints and drawings on paper, transparent vinyl and plastic fleece. Her work is inspired by scores as well as the personal autographs of composers, which vary the same way as does our very personal hand writing. 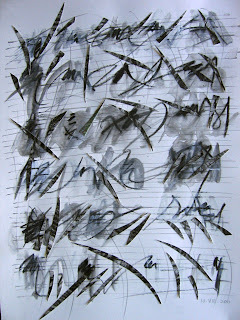 In some way Maria Tupay Duque’s art reminds of composers who created a new way of writing for their compositions like John Cage, Iannis Xenakis, Karlheinz Stockhausen or Roman Haubenstock-Ramati as well as artists who tried to visualize music through paintings like Paul Klee or Wassily Kandinsky. Unique in style and technique, Maria Tupay Duque might be seen in the long tradition of artists who were at the same time painters like Arnold Schönberg or those who were inspired by paintings or colours like Aleksandr Scriabin and Modest Mussorgsky. Although she is not a musician herself, her work has always been closely connected to music. K und K Wien talked to her about her inspirations and latest creations. How does music influence your work? Tupay Duque: I find it very hard to detach music from my life as I choose very carefully to which music I listen to when I am working in my studio. 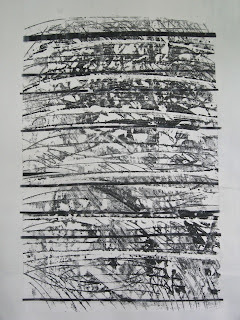 But I cannot really say it does influence my work unless I am working specifically on my "MUSIC SCORES" or "NOTATIONS", series of large size prints, which request the movements of the whole body. I am working on the floor, on my knees, which allows a bigger movement radius. This is a subject I have been working on for at least fifteen years and which became a big part of my work. Then there are periods when I work in silence. Silence creates an empty space which forms an important contrast to the long hours which are filled with music, when I listen to one piece over and over again for days. How do the different types of music inspire you and reflect in your paintings? 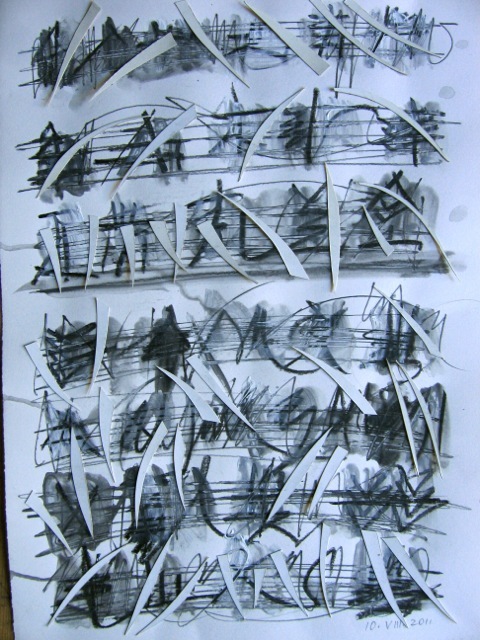 Tupay Duque: When I am working on my large prints which I call "NOTATIONS" I am listening mainly to chamber music or pieces which have been written for only one or two instruments. This makes it possible to follow the "graphic sound" or "graphic sound script" of each instrument. 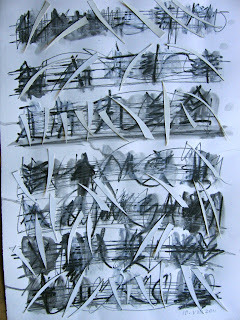 Pieces for orchestra are far too spatial as to associate them with a very graphic black and white visualization. I would associate orchestra music for instance more with spaces of coloured light. I am thinking about the work of James Turrell. How have you been inspired for your series of the "MUSIC SCORES"? Tupay Duque: My first inspirations were handwritten scores of composers of different epochs. I thought, that the movement of their handwriting resembled already the way they imagined how their music should be performed or the way they could hear it themselves. I believe that all of us carry music inside ourselves. The modern way of writing notations makes it possible for others to listen to it. But - as several composers of the 20th and 21st century stated - there must also be other ways, and they did find other ways to write music. It is the magic of the artistic creation to make this vast amount of inner images and sounds, the structures of an imaginary universe, visible. How can these complicated structures be made visible? A script is for me the highest form of abstraction. The connection between music and painting or graphic art might not be obvious at first sight. Since my very early childhood I was exposed to the fields of art, music and painting, but I never became a musician. I cannot even read music properly so it led to - I would almost call it an obsession, to be able to write it down in my own way. Where have they already been presented? Tupay Duque: Part of the series "From a Moravian summer", which were recently shown during the Al Quds Autumn Academy were presented in a group show in November 2011 in Beijing 798 and in May 2012 in France during a Chamber Music Festival (PENTECOTE EN BERRY, organized by Cyril Huvé and Brigitte Déchin). Several musicians, who performed during the festival responded with a very lively interest to these images and were discussing in which way to play the one or the other notation. Which other projects did you develop in connection with music? Tupay Duque: A few years ago I constructed a huge site specific sculpture in France, during a land art symposium at Jaujac in the Ardèche. While spending a day in a vast and very sunny pine forest I listened to the sounds of the wind and storm in the trees and later on constructed a wide spanned but also very delicate structure of dry branches and wires within a period of two weeks. First they were invisible but became visible in sunlight and when walking between the trees "PARTITION DU VENT, VISIBLE EN PLEIN SOLEIL". Other projects connected to music were the workshops with Palestinian children and youths during the Sounding Jerusalem Festival. In Austria I did something similar for the pupils and students of a music summer camp for string instruments. The idea is to encourage young people to find different ways to listen to music, in particular to classical music and express their feelings and emotions through painting. Born 1956 in Vienna into a family of graphic designer and photographer parents she studied at the Fine Arts Academy and the University of Applied Arts in Vienna and the CAFA (Central Academy of Fine Arts) in Beijing, Department of Traditional Painting and Calligraphy. She lived and worked in China and Hong Kong until 1992 and held exhibitions in Beijing, Hong Kong, Shanghai, Paris and Austria. Various land art projects led her to South Africa, France and Greece. 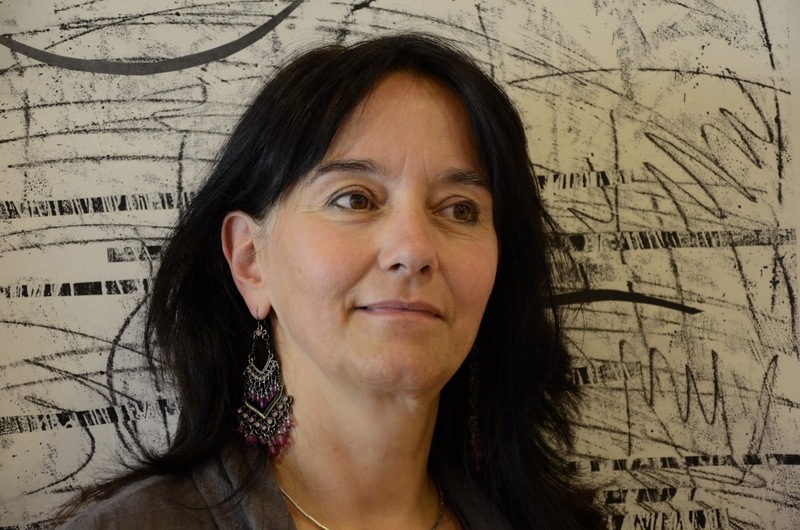 Maria Tupay Duque works mainly on paper, doing large format collages and monotype prints. Working during the last ten years on the subject of music scores as a form of writing she held Music and Painting workshops with Palestinian music students and children in Jerusalem and the Palestinian Territories as well as in Austria. Her painting "4th movement" was the sujet of the first Al Quds Composition Award which was launched and presented by Al Quds University College of Music in Jerusalem where she has also been responsible for the set design of the Award Celebration Gala.